Home Security: Can Your South Shore Home Pass a Security Test? What makes a home secure? Statistics reveal that a home burglary occurs every 15 seconds in the United States. It is important to work with professional services to ensure that your home is secure. While most people might immediately think about ordering a home security system, there are other things that you can also do to increase security. Professional electrician services are an important ingredient in home security. 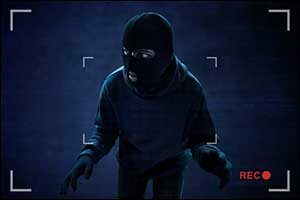 Increased outdoor lighting and other methods can be employed to deter burglars, whether you are home or out of town. If you do decide to install security cameras or another type of system, you will also want to hire a South Shore electrician to take care of this type of installation for you. Don’t make the mistake of considering electrical work to be a DIY project. Start securing your home by checking the doors and the windows. A whopping 33 percent of all burglars enter a home using the front door. So the best thing you can do is to make sure that the door frames are sturdy, the hinges are protected, the wood is not hollow, and that you do everything you can to secure it. Mail slots can be dangerous. Burglars will often reach their hand or a piece of wire through and unlock the door. Consider installing a peephole and a deadbolt for added protection. Check windows as well. Replace window latches with locks or even key-operated levers will help increase security. Ask your local handyman about upgrading your glass to something stronger – and don’t neglect basement windows! One of the best ways to secure your home is to install a security system. There are a variety of systems in a wide range of price points that you can use to protect your home. Alarms, motion sensors for doors and windows, smoke detectors, carbon monoxide detectors, and even video cameras for monitoring – these are just some of the available options. M Foley Electric can provide South Shore electrical services to design, install, and update video cameras for security and monitoring purposes. We have experience working with a wide range of commercial and residential security cameras. So whether you want high-tech solutions or low-tech cost-saving options, make sure to hire a South Shore electrician to ensure everything is installed correctly for best results. Is your property well-lit? Are there dark spots where burglars could hide at night? Contact M Foley Electric to do a perimeter check with our professional electrician services. We can recommend a wide range of lighting options, including wired automatic lighting, motion-sensor lighting, and even solar lighting, to increase protection for your home. Proper outdoor lighting enhances all of the other work that you are doing to secure your home. Residential electrical services are often the best place to start when working to increase security. Our team can assist you with a wide range of electrical upgrades and enhancements that you can use to your advantage. Landscaping can be very beneficial in the security of your home. Not only does it look great and add curb appeal to your property, but it can also be used to enhance security. Trim down all of your trees and shrubs near your home that burglars might use as cover. Choose smaller flowers and ground cover for those areas instead. Consider adding landscaping options that might prevent someone from wanting to be near those areas, such as thorny rose bushes and pricker bushes. In the southwest, people use bougainvillea, cacti and aloe plants under windows to prevent peepers and burglars. Ask your landscaper about similar options for the northeastern region that you can use to deter people from lurking near your home. In addition to protecting your home from outside threats, it is also important to protect it from fire hazards. Hire a South Shore electrician to perform a fire safety inspection of your home. Depending on the age of your structure, it might be time to update electrical outlets and fixtures to prevent electrical fires. If you have breakers and fuses that frequently trip or if you have “dead” outlets in your home, that could be a sign of something bigger occurring behind the walls. Professional electrician services will provide you with peace of mind in preventing electrical fires. This is a smart idea for new homeowners, as well as for people who have lived in the same home for many years. If you are interested in finding more ways to secure your home or to hire a South Shore electrician to see if your home passes the security test, contact M Foley Electric. Our team can help you with a wide range of commercial and residential electrical services. Give us a call at 1-857-829-0516 and speak with one of our team members about your needs. We can come out to your property and provide you with a free estimate for any of the professional electrician services that we offer in the Greater Boston area.